Our company is identified as one of the most celebrated Anjeer Suppliers from India. The Sweet Anjeer is widely demanded in the national as well as international market as no alternative is available for the same. The Anjeer Fruits is hygienically packed ensuring availability of no external contaminants that further may result in deterioration of quality. Further to benefit the clients with the tasty Anjeer Fruits, the array is sourced from leading vendors. 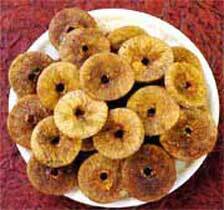 Additionally, customers are eased with the accessibility of the Wholesale Dried Figs at the most prolific deals.